What was it like to be in the first Great North Run? Liam, eleven years old, doesn’t know, but he’s excited to train for his first participation in the Run. The older kids run all the way from Newcastle to South Shields, thirteen miles. Liam is in the Junior division, running a shorter route. On the way to training, Liam and his Mam stop to care for Harry, an older gentleman. Liam is reluctant to take the time, but ends up glad they did. Harry tells him all about the first time he and his buddies ran to the sea. 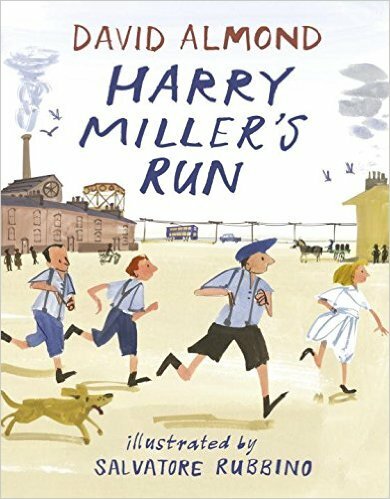 Harry and three friends set out on a lark and ran and ran. They stopped many times to get drinks. Once, they stopped to enlist the help of a girl who knew the way. “There’s a wolf on your tail! Run for your lovely life!” people would tell them. They knew they were done when they talked to the ice cream man on the Ocean Road. And Harry kept contact with the girl. Shortly after Liam’s visit, Harry died. Rubbino’s illustrations are perfect for the flavor of the times and the culture of Harry and Liam. The illustrations for present day are black and white, while the time of Harry’s first run are color, as Harry’s memories are so vivid. Though the story is about a specific event, it points out the importance of oral history and learning about traditions from our elders. Liam found that Harry had a lot to teach him. The dialectic dialogue is occasionally difficult to decipher, so younger or reluctant readers may need a little help with comprehension. But this story is well worth the effort.